Apart from a wonderful family and a loving boyfriend, I feel that I am one lucky person for having my college buddies, collectively known as "Tropang Isda" Why the name? According to a random forwarded SMS, a goldfish’s memory only lasts 3 seconds. FACT: I and my friends forget stuff in a matter of 3 seconds. LOL. Seriously though, we are a bunch of very forgetful people, hence the “isda” title. Tropang Isda as PLM Freshmen, taken 6 years ago. Last weekend we (isda girls along with two boyfies) had an out-of-town trip to Bauan, Batangas. Our original plan is to check out the famous Laiya beach but when we called in for reservations, all rooms are already booked for all weekends of May (Note: We called as early as third week of March!) So we had no choice but to search for other possible venues. After a few more tries, I found Coconut Hills Beach Resort over the net. Website is okay, photo gallery is okay, accommodations and rates are okay. Add those to the fact that it satisfies one of our primary considerations: WHITE SAND BEACH (or at least their website says so :)) I wasted no time. I called up the number in the site, my inquiries were answered and the next day, I deposited the downpayment. Problem solved, we already got a venue for the Isda Outing 2010. Because the reservation process happened too fast (yeah, maybe we got too excited), I wasn’t able to check out reviews for the resort before depositing the DP. And when I did, I found some not very good ones. We’ve already paid half of the room rate so all we could do is pray that the negative feedback isn’t true. After the long wait, May 15 came. We were all set – Myself, Noreen, Nhix, Jaq and her bf Edmund, and Jejo and her bf Emil – and a little over 8AM, we left Manila with dad as our driver. We headed to SLEX. We were advised by Miles, the resort manager, to come in earlier because the town is celebrating their very first fiesta and we might not be able to get a parking space. We took the Skyway to avoid heavy traffic but to no avail. 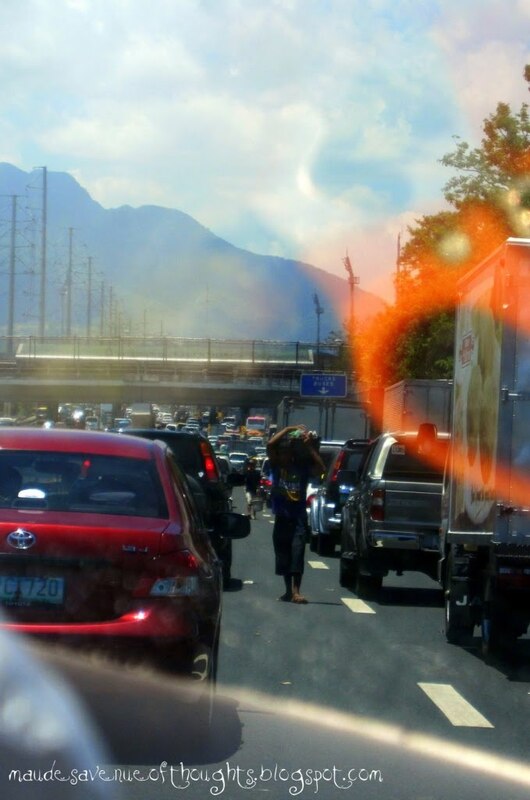 To make it worse, we were stuck in heavier traffic from Silangan Exit to the toll plaza in Calamba. Do they really call it “Expressway”?!?! Past the toll plaza, the trip got lighter and faster. We reached Lucena-Batangas exit and entered the STAR Tollway. It was my first time to pass through the said highway, and I was amazed and amused because the road looked unending. There’s really never a dull moment with my girls, we were all laughing as we traversed more than 25 kilometers to Bauan proper. No one’s been to the area yet and all we got was a not-so-accurate sketch from the resort’s website, so every now and then we had to stop to ask the locals for direction. We turned right upon seeing Rising Tide Construction Supply (the landmark in the sketch), and that’s when the real adventure started. We thought we are already near the beach but we were wrong. So wrong. We drove along a narrow and very steep road wherein only one vehicle could pass at a time. Loud chit-chats and laughters were replaced by silence and swear words uttered by dad as we passed through dangerous curves (think acute angles). We were literally holding our breaths because one wrong turn and our time is up. Luckily though, after almost 6 hours of travel, we got to Coconut Hills Beach Resort alive. Thank heavens. A properly scaled sketch isn't so bad an idea. The view from our room's terrace. Shortly after our arrival, we had lunch al fresco style. We later relaxed and stayed inside the room because we thought it’s still too hot to swim. That’s when I noticed that there are only 2 double beds and 2 twin beds when Miles said it has 3 double beds and a twin. Good thing they’re all comfy so the size became insignificant. Another thing that my friends noted was that it could’ve been better if the Ocean Suite (that’s how they call it) has a TV set for additional entertainment when chilling indoors. This is the only reason I wouldn’t choose to go back to Coconut Hills. It’s too far from the main road let alone the fact that the path going there is worse than Baguio’s zigzag roads. They say, however, that you can go straight to Anilao Port (to spare yourself from the extra challenging drive downhill) and get to the resort via boat transfer but I don’t think you’d be at ease leaving your car at the other side of the sea, right? The room is okay except that early on, the ACU just can’t cool the room. At around 10pm, dad can’t take the heat anymore so he talked to the resort manager about it. That’s when we knew that it is not the ACU’s fault but the electric company providing electricity in the area. This is one point well taken in the review we found over the net. Their service provider cannot supply enough power during certain times of the day, thus they have a generator. Immediately after my dad made the issue known to the management, they turned their generator on and the ACU in our suite worked pretty well. I remember I woke up in the middle of the night to pull the blanket because it was so darn cold. Careful what you wish for. LOL. The bathroom in our suite is nice and clean albeit the heater is out of order. But for someone like me who is used to bathing in cold water, two thumbs up. Water supply is okay. There was a very short instant that there’s no water running out of the faucet but in 10-15 minutes, the sufficient water supply is back. Also, it takes time for the water in the toilet tank to be replenished after flushing that’s why we used pail and dipper most of the time. On a lighter note, our bathroom is equipped with a large sink, a shower head and a towel rack which is commendable. The public shower rooms are okay but they don’t have towel racks so we still opt to bathe in our private bathroom. I didn’t check the prices in the restaurant because we brought our own food but according to my dad, beer and liquors are very pricey (think 100% mark-up). I also think ice (the one that’s usually sold in sari-sari stores for 2 or 3 pesos each) is overpriced at PhP 10 each. Or maybe that’s the way business works in resorts. When we first went swimming in the beach, we were disappointed because it has big rocks and it’s not possible to swim farther without hurting your feet, so we just took pictures by the shore. Good thing when we checked out the beach the next morning (my friends were there as early as 5:30 am), we found out that it was just at low tide when we arrived, thus we had a better swimming experience on our 2nd day of stay (oh, and more pictures too!). The sand is (considerably) white but not as fine as Boracay’s or Puerto Galera’s (we were quite expecting this already so we’re not that disappointed). Nevertheless, we were impressed with the clear and clean water. The swimming pool is small and simple. We don’t give much attention to the design anyway, as long as it provides an alternative when we don’t want to swim in the beach anymore. The cottages near the pool, however, added drama to the pool area. And I love how the lounge chairs are put in a covered area beside the pool just so when you want a break from the sun’s heat, it’ll be the perfect spot! :) I think it is also essential to note that we were told by one of the staff that the pool will be available for use only until 11pm and after 7am because cleaning time is at 6am but when we dipped in at around 9, it doesn’t look like the water was replaced. The staff is accommodating. However, when we wanted some bottles of beer at around 11pm, much to our surprise, the reception area/restaurant is already closed. I saw a crew outside and asked for his assistance. We had to wake the restaurant staff up to get ice-cold beer inside. And when my other friends wanted drinks as well, they woke up the staff again. I think it’ll be better to work on shifting schedules so that they can cater to the needs of their guests round the clock. The review that the staff is rude and is already waiting outside the room an hour before checkout is not true (at least based on our experience). In fact, we left the room 20 or 30 minutes after the standard checkout time but we were not charged for it. They don’t have their own parking lot but thankfully there’s no harm done to our car in the public parking area. We’re happy that the unpleasant review that we found is just an exaggeration (or the writer was just a victim of an ill-fated train of events). If I were to rate our stay in Coconut Hills, it’ll be 7 out of 10. As I’ve earlier said, had it not been for the resort’s location, I would surely go back. We took a few more souvenir shots before we left the resort at around 1pm. Upon getting into the car, we all prayed that we’ll be able to go past the dangerous curves again. While driving, everyone’s silent again and as if continually murmuring a prayer. Each successful turn dad makes merits cheers and applause. When we finally made it to the main road, the Isda Girls sang what we always sing after project defense sessions: God is good… All the time! :) We were in high spirits because of two things: (1) We were able to get out of the mountains alive; and (2) We’re now off to Tagaytay! Because of the traffic we experienced in SLEX on our way to Bauan, we’ve decided to just take a different route going home – via Lemery, Tagaytay, Bacoor then Roxas Blvd. It may be a longer course but there is a small probability of heavy traffic, plus sight-seeing would sure make the lengthy journey less of a burden. And since we’re passing by Tagaytay, why don’t we stopover? Thus, we decided we’ll be having lunch there. Next question is which of the many restos in Tagaytay? Me: Sabi masarap daw bulalo dun. So pili, either Leslie’s or RSM. Them: Ano bang mas masarap? Noreen: O cge, so RSM tayo. At around 3PM we reached RSM Lutong Bahay. Great ambiance they have there. Outside the dining area is a viewing deck to get a better look at Taal Volcano and take Facebook-worthy pictures. Of course we saved that for later because we are all hungry already. We got 2 orders of Bulalo and an order of Ginataang Gulay. After a few minutes, the food was served and in an instant, the whole table was hushed. Everyone’s busy filling their stomachs with those palatable Pinoy dishes. The food was really good. The bulalo at PhP 450 proved itself worthy of its price. Aside from being flavorful (the soup alone can be considered a viand), it was more than enough for 4 persons even if the menu said it’s only good for 2. The Ginataang Gulay’s also a winner. The veggies were cooked just right and the coco milk's texture was perfect. Oh my, I am salivating. On top of the sumptuous food, what made our lunch at RSM more remarkable was when we were serenaded by a group of 5. They sang My Girl and Binibini. Excellent vocals that when you close your eyes, you wouldn’t think they are singing live! :) We really enjoyed their performance. After eating, we went to the spot overlooking Taal and took pictures. We had like 20 shots and were good to go. In an hour and a half we reached my place. Choosing the Tagaytay route wasn’t a mistake because it was indeed faster than taking the expressway (ironically). Toll fee is even cheaper, 177 (going there) vs. 22 (going home). Upon getting home, first thing we did was get the laptop and the card reader then secure our copies of the pictures from the cameras we brought with us. Spell photo addicts. LOL. love it sooo much! :) nikikilig ako.. hehehe..
My wife and I are planning to go next week however we've read so many negative blogs about cocohills. ok yung review mo at least mejo positive naman. the question is, ok naman ba service and staff? price is okay for as long as accommodating and maayos yung facilities.